Fire Separations in Attached Garages | Chicagoland Home Inspectors, Inc. If a fire starts in a garage, you do not want it to spread to the attached house. Additionally, if you start up your vehicle in the garage, you do not want carbon monoxide entering your home. Homeowners (me included) have a tendency to store an assortment of flammable materials in garages. Gas, diesel fuel, paint thinners and removers, cleaning solvents, propane cylinders, swimming pool chemicals, and other compressed gasses such as welding gas. I have also been on many calls as a fireman where the car was started inside the garage so it can warm up. This allows carbon monoxide (CO) and other gas accumulation within the garage. Fire separations are required between residences and attached garages and their attics. We find, and document, this issue often during our home inspections. Openings from a private garage directly into a room used for sleeping purposes shall not be permitted. Other openings between the garage and residence shall be equipped with solid wood doors not less than 13/8 inches (35 mm) in thickness, solid or honeycomb-core steel doors not less than 13/8 inches (35 mm) thick, or 20-minute fire-rated doors, equipped with a self-closing or automatic closing device. (Many communities have amended the self-closing or automatic closing device to read self-latching hardware). I haven’t memorized every community’s code (also every year of every code) about this reference. I treat the above reference by looking for a self closing device and if it is present, then it should work. I just recently did a home inspection in Chicago that had the dryer vent running through the garage and exited the structure through the garage wall. This is not acceptable and I consider this a breach in the fire separation. Penetrations through the separation required in Section R302.6 (see below) shall be protected as required by Section R302.11, Item 4. (At openings around vents, pipes, ducts, cables and wires at ceiling and floor level, with an approved material to resist the free passage of flame and products of combustion. The material filling this annular space shall not be required to meet the ASTM E 136 requirements.) This means that fire rated sealant is not required. Typically drywall mud is installed here and that is acceptable. One obvious example of a ceiling fire separation breach is the near an attic pull-down stair unit. Many of the pull down stairs that I see are not designed for this installation. 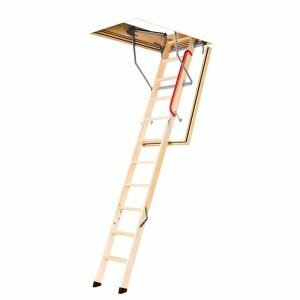 They do make pull down stairs that are rated for this type of installation, but those commonly are not found at the home repair stores. The photo to the left is a ladder that is designed for garage penetrations. The door of the ladder fully closes and seals when the ladder is in the up position. The post Fire Separations in Attached Garages appeared first on Chicagoland Home Inspectors Inc..